First published November 22, 2015 , last updated April 23, 2019 . Reading time: 5 minutes. You already know how to cut your own hair. It’s quite easy, and loads of people do it to save money and time on their hair. All you need, really, is a set of hair clippers. Here is a time-saving research of the top cordless hair clippers or here, a thorough run-down of best balding clippers if you want the perfect one-over solution for the top of your head. But what if you don’t want a plain old buzzcut? Well, that’s where our kickass guides on the most popular clipper cut hairstyles come in. Following is a collection of the slightly advanced clipper cuts to take your at-home hair cutting to the next level. 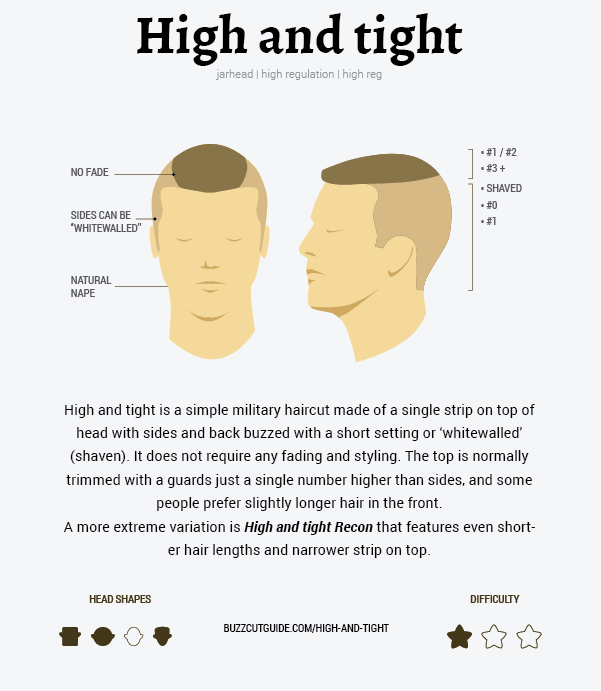 You’re here, which means you’re probably looking for a complete guide on buzzcut styles & types. At Buzzcut Guide we love to experiment with our hair and show you how you can do it, too. So, if you’re looking for a place to learn and put in practice those DIY skills, you’ve come to the right place. Bellow you’ll find all the buzzcut style possibilities. Make sure you click on each of them to find detailed instructions. 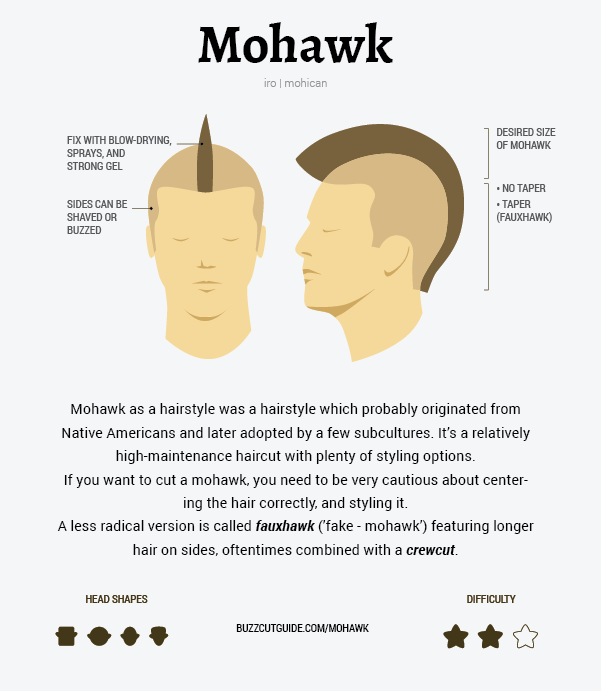 The origins of the Mohawk style are suspected to be from Native Americans and later adopted by a few subcultures living nearby. Although this style is a high maintenance option, it offers many styling options. A Mohawk consists of shaved sides, and a very narrow strand of longer hair on top. It is a radical haircut, but there are softer versions like the faux hawk, where the sides aren’t as short. Are you a lazyawk kind of person, or you like to style your hair? You can make your Mohawk stand out by blow drying it, use gel, wax, spray, sugar or even starch. Put your head upside down and blow-dry it. Apply gel or glue and then use a lot of spray on the hair and allow it to dry before you lift up your head. 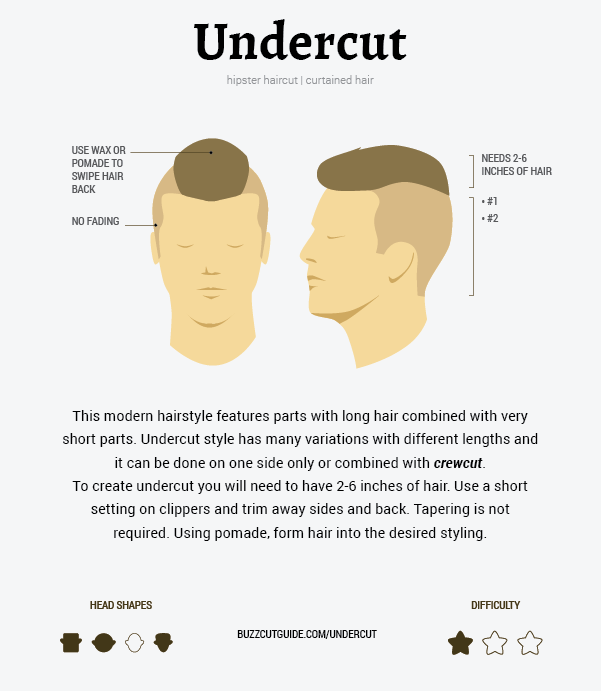 An undercut consists in having parts of your head shaved and leaving the rest of the hair longer or untouched. The process of doing an undercut is similar to the Mohawk. First you need to decide just how narrow or wide the part with the longer hair will be. To shave both sides, use a shorter number of clippers (#1 or #2) and cut away the sides as well as the back of your head. You don’t need to buzz both sides, there are many possibilities: shaving just one side, a quarter, or even just the nape. Make sure that every part of the head is just as you wanted it to be then using hair pomade, style your hair into your desired design. This style is a simple military haircut in which a single strip of hair stands on top of the head and the sides are shorter. It does not need any fading or styling. Normally, the clippers used at the top of the head are one size larger than the size of the clippers used on the sides and back of the head. A “high and tight recon” is a more radical variation of this haircut. It features a narrower strip on top as well as shorter lengths of hair on the sides. These might be the easiest DIY buzzcut styles and haircuts out there, since you’ll use the same length of guard all over the head. 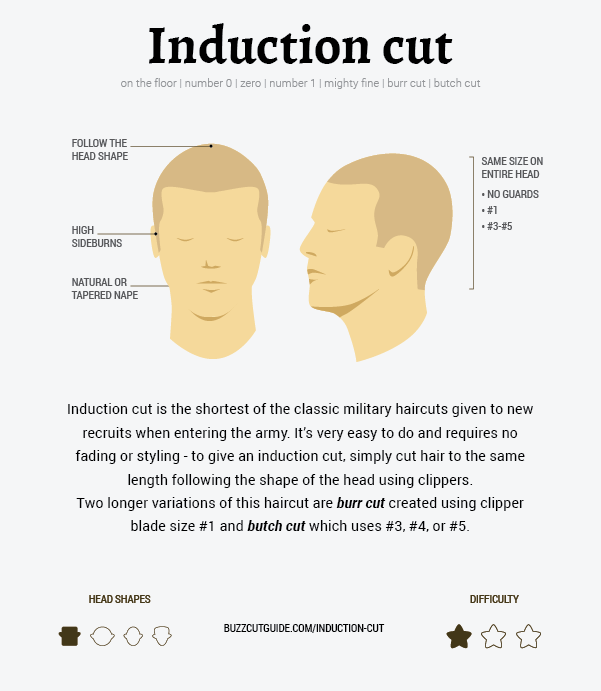 The induction cut is one of the shortest possible haircuts that you can do without using a razor blade. The Burr cut comes in with the use of guard #1 while the butch cut uses any guard from #3 to #6. These cuts are very simple to do on your own. You just shave against the grain all over the head and you’re good to go! This buzzcut is an ‘old school’ style featured in many videos recorded in the 90s. This hair cut presents a blocky appearance on the top of the head with longer taper on the sides and on the back of the head. The Flattop cut has had a variation called the ‘horse shoe” in which the blocky part get a strip of short hair to create an appearance similar to a shoe. 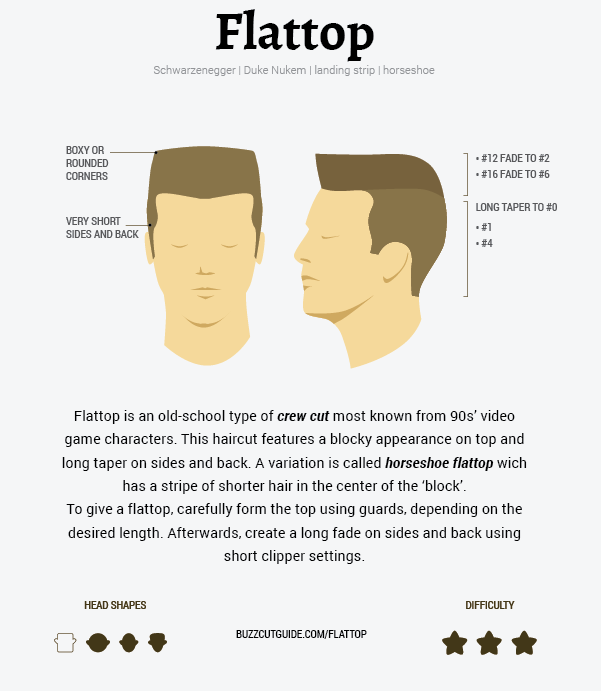 To create a flattop, use guards to create the blocky top and then use clippers to create a fade on the back and sides. Style it with wax or gel in between trims to keep that top rocking. 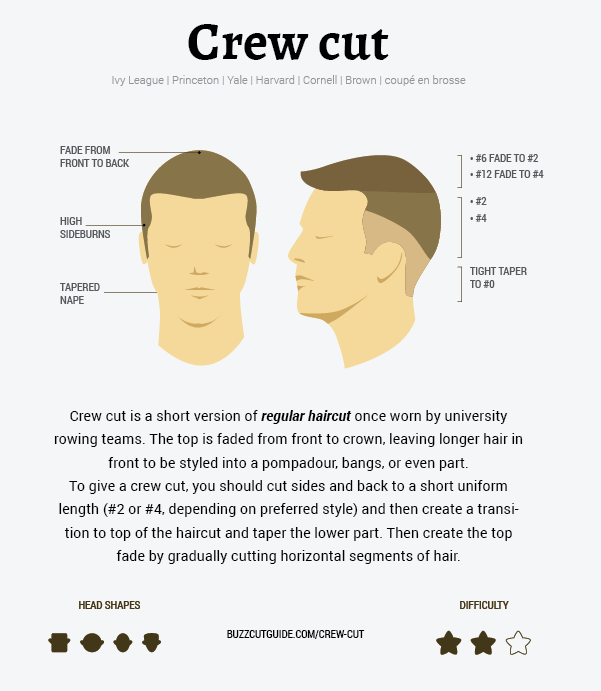 The crew cut consists in having the top front of your hair longer than the sides, fading from front to crown, then leaving the front part to be styled into bangs or pompadour. The back and sides of the head form a uniform feel, using larger sizes of guards and clippers; the hair at the top is cut to create a transition while tapering the lower part. You don’t need to style it, but some hair product will give you a neater appearance. In comparison to other cuts it this one is hard to master if you’re not experienced with fading, but you’ll be able to change that in no time. And here we go! These are the 6 most popular buzzcut styles in the world. Have you decided on which one to get yet? Then we recommend you to go check out our articles on how to cut your own hair. Have fun experimenting and we’ll see you there!